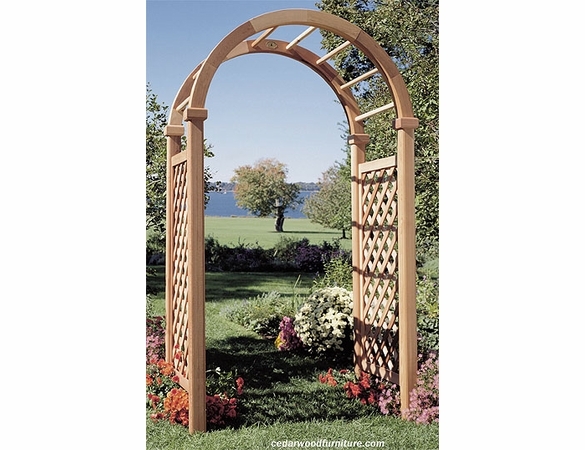 Improve your home’s curb appeal or add a grand entrance to your garden, patio or backyard with the exquisitely crafted Cedar Wood New England Deluxe Arbor from Cedarwood Furniture. Made of premium Western red cedar, this enchanting piece stands an imposing 96” tall, with a 48” opening and a depth of 32”. Rust-resistant hardware and cedar’s natural oils help it withstand the weather. It ships 85 percent pre-assembled and comes with full instructions for easy completion.  Premium Western Red Cedar.  Finely sanded natural finish. For a similar arbor see the Arbor Pagoda, or navigate back to the Garden Arbors page to view our full collection. Dimensions: 48" opening, 96" High, 32" depth.